שְׁתֵּי כְּרִיכוֹת הַמּוּבְדָּלוֹת זוֹ מִזּוֹ שִׁכְחָה, שָׁלֹש אֵין שִׁכְחָה. שְׁנֵי עֳמָרִין הַמּוּבְדָּלוֹת זֶה מִזֶּה שִׁכְחָה, שְׁלֹשָה אֵין שִׁכְחָה. שְׁתֵּי גְּפָנִים הַמּוּבְדָּלוֹת זוֹ מִזּוֹ שִׁכְחָה, שְׁלֹשָה אֵין שִׁכְחָה. שְׁנֵי גַּרְגְּרִין פֶּרֶט, שְׁלֹשָה אֵין פֶּרֶט. שְׁתֵּי שִׁבֳּלִין הַמּוּטָּלוֹת כְּדַרְכָּן לֶקֶט, שָׁלֹש אֵין לֶקֶט. אֵילּוּ דִּבְרֵי בֵּית הִלֵּל. Mishna Peah 6:5 states and argument between Bet Shammai and Bet Hillel regarding the number of items to which Shikcha and Leket apply. According to Bet Hillel Shikcha and Leket apply only to one or two sheaves or stalks, respectively, but not to three, meaning that if the farmer forgot three sheaves or dropped three stalks he may go back to the field and get them. However, according to Bet Shammai it applies even to three, but not to four. The Mishna lists various scenarios of Shikcha and Leket involving sheaves, stalks of grain, olives, carobs, flax, and grapes. Our Tosefta expands on this law by adding additional scenarios not listed in the Mishna to this argument. The reasoning behind each opinion seems to stem from tradition and desire to either protect the farmers from heavy losses (i.e. Bet Hillel) or being stringent with regard to the Torah’s commandment to help the poor (i.e. Bet Shammai). Talmud Yerushalmi (Peah 6:4, Daf 30a) quotes two opinions of Amoraim of reasons for opinions of Bet Shammai and Bet Hillel. Both are Derashot (derivations of verses) from the Torah, from various verses. Clearly since these are opinions of later Amoraim that seems to be more of a post-factum reasoning, which was created as a proof for an existing argument, which was originally based on tradition and not on Derashot. After every mower follows a gatherer, who, being provided with a hook or stick about two feet long, gathers up the corn, makes it into a gavel, and lays it gently on the ground. This must be done with spirit (i.e. fast), as another mower immediately follows. “The Genesee farmer”, Volume 2, 1832, p. 222, article “From Dean’s New England Farmer: Mowing”, July 14, 1832. The gavels were either randomly thrown around the field or neatly put in rows. In a large field it would be a lot more efficient to neatly line up the gavels so that the gatherers would have easy access to them and could tie them into sheaves faster. The explanation of Kricha mentioned by most commentators as “a small sheaf”, a few of which would be tied into a large sheaf, called an Omer, is simply not correct, because all tied bundles have been called sheaves regardless of their size. See Mishna Peah 6:6. Also, we do not really find in any farming literature of the past that the farmers would tie the bundles twice, once into a small bundle and a second time the small bundles into a large sheaf. This simply seems to be counterproductive and big waste of precious time and effort. Therefore it is clear that Kricha is a gavel and not a small sheaf. 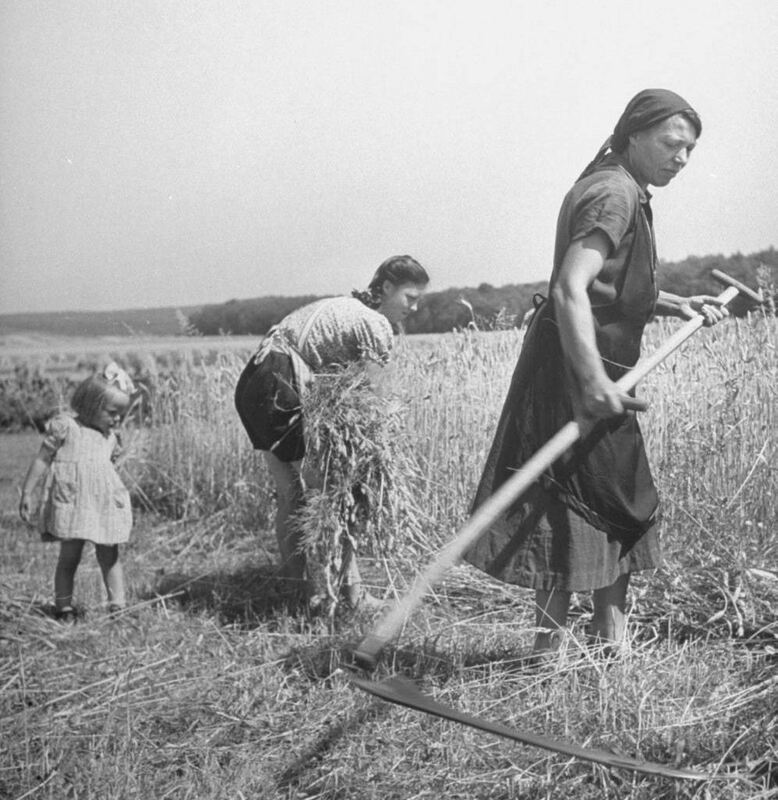 Woman mowing wheat with a scythe in Hesslar, Germany, August 1, 1946. Photo: Walter Sanders. Notice the girl behind her picking up the wheat and making a gavel out of it. It seems that this woman is working alone on a family farm, since he children are following her and therefore there is really no need for her to neatly line up the gavels. Her daughter seems to be managing just fine with the random piles thrown on the ground. Abel Grimmer, An Allegory of Summer, Flanders, early 1600s. Anonymous sale, New York, Sotheby’s, 13 October, 1989, lot 51. 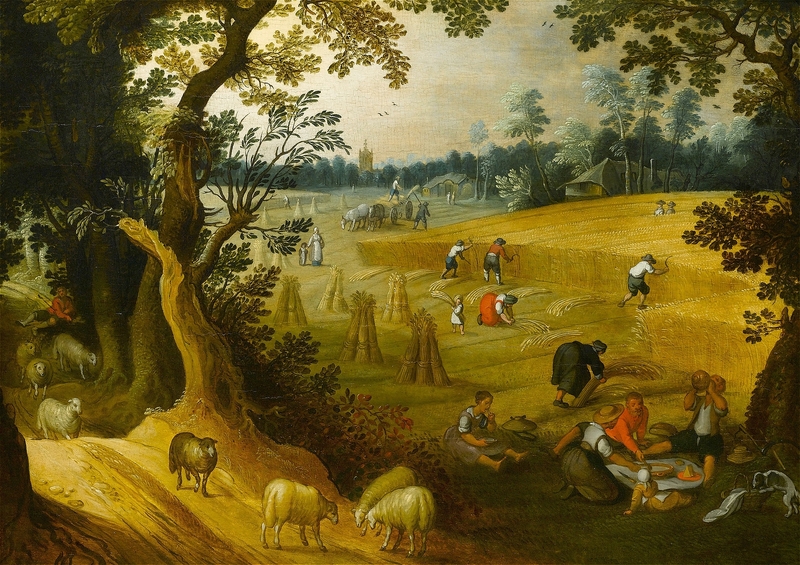 This painting illustrates very well the full harvesting process, with men in the background cutting the wheat and throwing gavels on the ground, while women follow behind them and tie the gavels into sheaves, which they then stook into stooks. Closeup from Abel Grimmer, An Allegory of Summer. 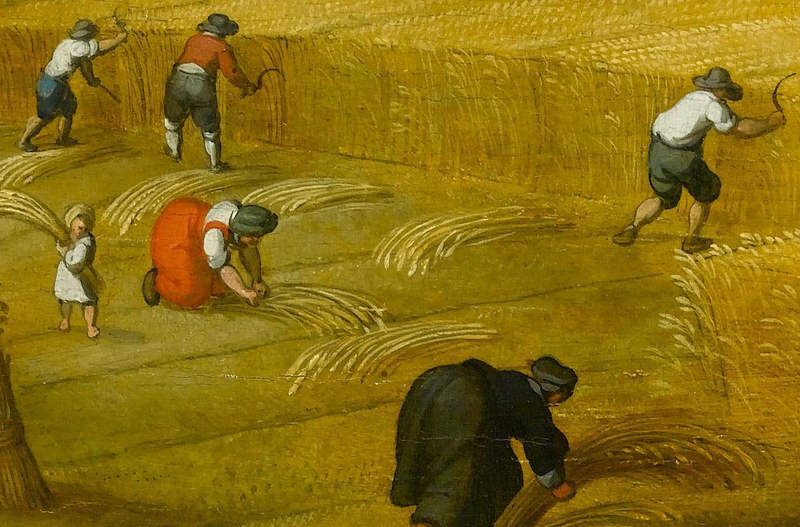 Notice that the men are mowing the wheat with sickles and the women behind them are taking the gavels and are tying them into sheaves. Before the gavels are tied into sheaves they are neatly placed in rows. Skillful wheat binder. An instructional illustration from the 19th century. 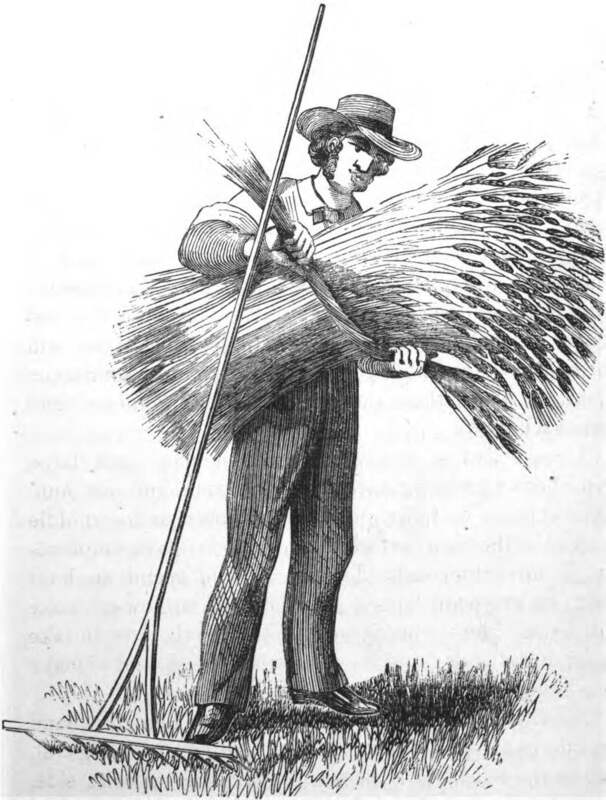 Note that the farmer has a rake with him with which he gathers up the individual stalks left by the mower into a gavel and then ties it into a sheaf using a few twisted wheat stalks, called “a band”. From The American Wheat Culturist, p. 359. The Tosefta seems to emphasize that this law of two, but not three, applies even to gavels that are separated (i.e. not touching) from each other and not just to gavels that are lying one on top of the other or next to each other and are touching each other. The reason that we may think that they have to touch is because there has to be some clear definition of what is two gavels, sheaves or stalks considered to be “together” or considered to be “separate” for the purpose of Shikcha and Leket, and it is very easy to distinguish between touching and non-touching objects. Therefore the Tosefta comes to teach us that even if the gavels, sheaves or stalks are not touching each other, as long as they appear to be forgotten together, then they would be considered to be Shikcha or Leket. There is no need to define some specific maximum distance between them and require every poor person collecting the gifts to measure that distance between the items. As long as they appear to the naked eye as something that was dropped or left behind in a single pass it would suffice. According to Minchat Yitzchak the Tosefta means to emphasize that the small bundles are not tied together, because then they would be considered a single sheaf and therefore would be considered Shikcha, even if three bundles were tied together. However, that explanation is clearly wrong and does not make any sense, because if the word Omer, means a large sheaf tied from a few small sheaves as Minchat Yitzchak and other commentators claim, then every Mishna and Tosefta that used it before in the context of Shikcha already implied that it is considered as one and not as many, by definition of the word, and therefore it would be superfluous to emphasize it here again. The logic behind this law regarding sheaves is exactly the same as behind gavels as I explained in the previous note. The Tosefta holds that Shikcha applies even to growing trees that are attached to the ground, as ruled by the Rambam (Hilchot Matnot Aniyim 5:16 and 5:22), whose source is this Tosefta. So if the farmer simply forgot to harvest any grape clusters from a whole grapevine then all the grape clusters on that vine would be considered Shikcha and can be taken by the poor. The Tosefta does not need to mention individual grape clusters, because it is obvious that Shikcha applies to them since it applies to a whole tree with multiple clusters. 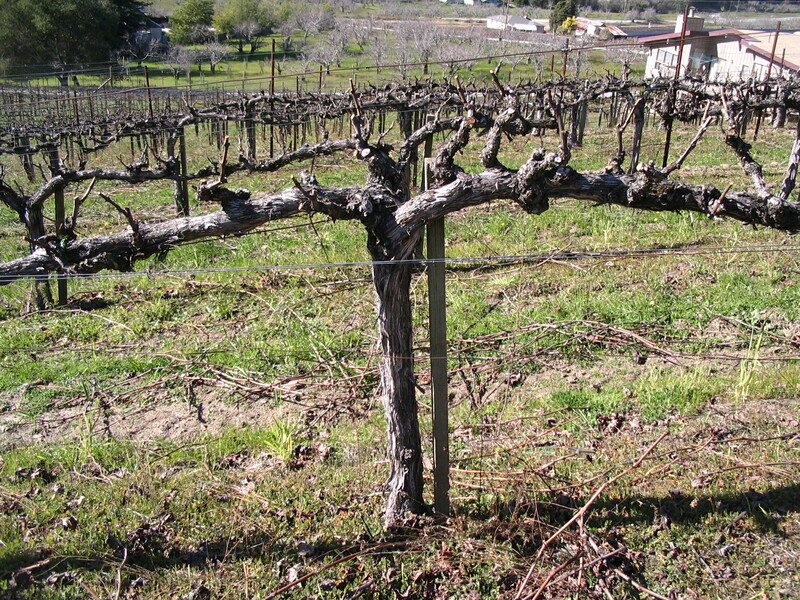 Grapevines can be trained to grow multiple vines from a single trunk by proper pruning and guiding the vine along poles and/or strings called Trellis. 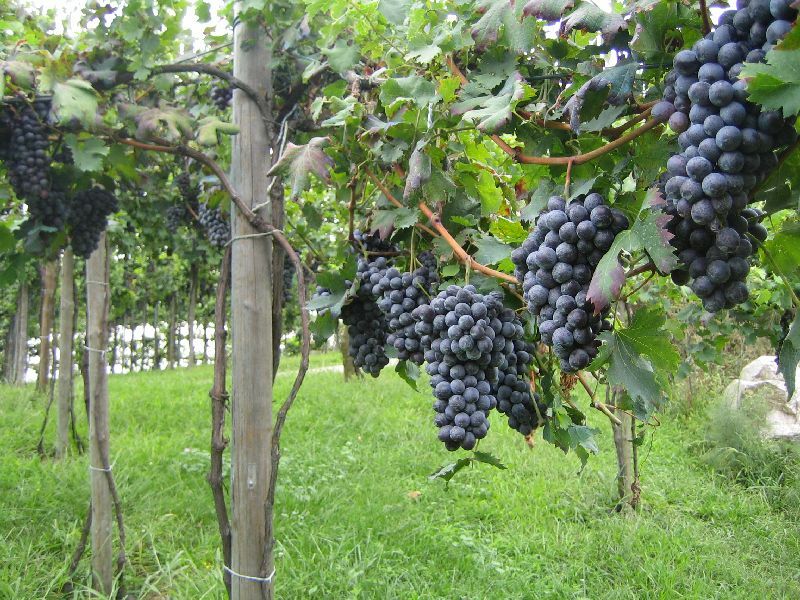 There are various methods of training grapevines, some of which were implemented by the Romans and it is safe to assume that the same methods were used in the Land of Israel as well. The Roman writer Columella in the 1st century CE mentions techniques of training the vines to grow along trees in a specially planted grove for that purpose called Arbustum or in a vineyard proper, called Vinea, training them to grow along a pole and then spread out onto a Trellis. See Lucius Junius Moderatus Columella, De Re Rustica (On Agriculture), Book III 2:8-9, Loeb Edition Vol. 1, p. 237, Book IV 26:1-4, Loeb Edition Vol. 1, p. 429-431, and Lucius Junius Moderatus Columella, De Arboribus (On Trees), 4:1. Pinot Noir vineyard near Santa Cruz, California. Photo: Dave Tong, taken on February 9, 2008. Notice the vines are pruned in a way so that they split into two. Each vine grows along a pole and then follows strings that are tied between the poles, a Trellis. Arbustum vineyard with Moradella and Vespolina grape varieties vines trained along Maple shafts, grown according to Columella’s description, on Molino Miradolo farm in Robbio, Lomelino Region, Pavia, Northern Italy, in 2007. Photo: altissimoceto.it. Notice that there are two vines climbing along each shaft. Columella (De Re Rustica, Book IV 26:1-4) described that either two or four vines can be guided along a shaft and then split into opposite directions in the shape of a T or or an X. The Tosefta needs to emphasize that it is talking about grapevines that are separated from each other and not a single trunk trained to split into multiple vines. Such a vine would be considered as one vine and therefore even if it splits into multiple vines as long as all of them originate from the same trunk then they would be considered Shikcha, despite that they look like three or more vines. However, if there are two vines each of which grows from a separate trunk, next to each other and the farmer forgot to pick the grapes from both of them then all of those grapes are Shikcha. However, three such vines in a row that were forgotten to be picked are not Shikcha and cannot be picked by the poor. 7. For the description of the law of Peret see above Tosefta Peah 1:13, note 5. By Peret the Tosefta does not say anything about them being separated from one another, because Peret by definition is individual grape berries that fell off the vine, and therefore regardless if the berries fell off the vine onto the ground and they are completely detached from the stem and are lying next to each other, or if they are still attached to the stem and therefore are connected together, they are recognizable as individual berries, and therefore two next to each other would be considered Peret and three would not. There are two conflicting readings in this statement of the Tosefta. The Vienna manuscript says: שְׁתֵּי שִׁבֳּלִין הַמּוּטָּלוֹת כְּדַרְכָּן לֶקֶט, Two stalks [of grain] that are lying [on the ground] in the usual fashion are [considered to be] Leket. The Erfurt manuscript says: שְׁתֵּי שִׁבֳּלִין המובדלות זו מזו כְּדַרְכָּן לֶקֶט, Two stalks [of grain] separated from one another in the usual fashion are [considered to be] Leket. It is really not clear what the Tosefta means by saying “in the usual fashion” according to either reading. The explanation proposed by Minchat Yitzchak (Shirei Mincha, Peah 3:10, Shtei Shibolin Hamuvdalot Kedarkan) is that “the usual way” means that the two stalks are growing from the same root, but look separate above ground, as opposed to two stalks that are really a single stalk split into two. Tosefta Kifshuta takes his explanation even further and says that it applies not just to still standing stalks, but also to a single stalk that split into two stalks, then has been cut off and when it fell to the ground it separated into two individual stalks. He says that such a stalk is still considered to be one stalk and is therefore for sure considered to be Leket. I do not agree with either of these explanations for two reasons. First, it does not make sense agriculturally. Farmers do not cut off stalks one by one. They cut them off in bundles and therefore the farmer would never pay attention to which stalk was single and which was split into two. Second, the case that the Tosefta is referring to must be visually recognizable to the poor, because it is they who have to decide whether they are allowed to pick it up or not, and the only way for them to be able to do that is if it is visually obvious if these stalks are lying “in the usual fashion” or not, without the poor knowing how the farmer cut them off and if originally they were one stalk or two. I would like to propose that the Tosefta is not referring to the way these stalks grew, but rather to the way they are positioned on the ground, and therefore it would be obvious to the poor which stalks they are allowed to take and which they are not allowed to take. Before I proceed with the explanation I have to say that the correct reading is the reading is,שְׁתֵּי שִׁבֳּלִין הַמּוּטָּלוֹת כְּדַרְכָּן לֶקֶט , Two stalks [of grain] that are lying [on the ground] in the usual fashion are [considered to be] Leket, as written in the Vienna manuscript and not in the Erfurt Manuscript. I would like to suggest that the Tosefta emphasizes the case where the individual stalks fell down by accident as opposed to being laid down on purpose as a part of a gavel. If the farmer cut off a gavel and laid it out on the ground then all stalks would be pointing in one direction and lying in parallel to each other. Then if the gatherer picked up that gavel in order to tie it into a sheaf and while doing so forgot a couple of stalks on the ground, then those stalks would remain lying there together in parallel to each other and pointing in the same direction. The Tosefta emphasizes that such stalks are not considered Leket, because they were not dropped during the reaping process. But stalks that were dropped by accident during reaping would fall down randomly and therefore even if they are touching each other they will not be pointing in the same direction, and therefore would be indicating to the poor that they may be picked up as Leket. By saying that the stalks are lying in the usual fashion the Tosefta means to say that they appear to have fallen by accident as a part of the reaping process and were not put there on purpose. Erfurt Manuscript’s reading that says “two stalks [of grain] separated from one another in the usual fashion” does not make sense, because most stalks that would fall down as a part of the reaping process would be touching each other when they fall one on top of the other, and therefore them being separate is not an indication of how they ended up on the ground. It was most probably an error made by the copyist who did not understand the meaning, but who rather thought that the Tosefta should be using the same expression here as it did in the previous cases that talked about Shikcha. I have quoted the reading as it appears in the Vienna Manuscript since it goes in line with the opinion of Bet Hillel stated in Mishna Peah 6:5. The Erfurt Manuscript says here “These are the words of Bet Shammai”, which is in direct contradiction with the Mishna. This seems to be a copyist’s error.